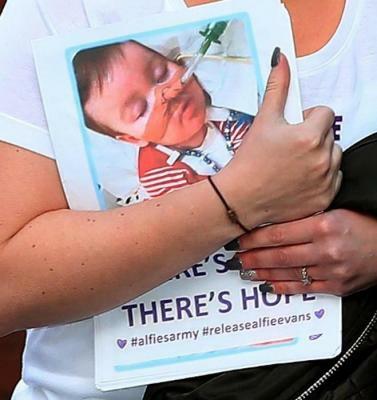 ROME – Italy continued to exert pressure on the UK Tuesday to allow a terminally ill boy, Alfie Evans, to travel to Rome for treatment after the Italian Government granted him Italian citizenship in an effort to break the stand-off between his parents and the British judiciary. The 23-month-old toddler had his life support withdrawn at 23:30 CET Monday, but is still alive and in no pain, family sources said, adding that doctors have been left “gobsmacked” that Alfie has been able to sustain his own life for so long. Alfie, who is suffering from a rare undiagnosed degenerative neurological condition received mouth-to-mouth resuscitation from his parents through Monday night after his respirator was turned off. The parents, Tom Evans and Kate James, lost a legal battle in Feb earlier this year for the Alder Hey Children's Hospital, where Alfie has been since 2016, to remove his life support. Pope Francis weighed into the debate over the case Monday night by sending a Tweet expressing the hope the boy will be allowed to take up an offer of treatment at the Bambin Gesu Hospital run by the Holy See in Rome. “Moved by the prayers and immense solidarity shown little Alfie Evans, I renew my appeal that the suffering of his parents may be heard and that their desire to seek new forms of treatment may be granted,” the pope tweeted on Monday. The Italian government said early on Tuesday that they would clear Aflie’s “immediate transfer to Italy,” but the next steps for the toddler and his parents remain delicately balanced.